Treat your bar area to some modern elegance with the Houston Bar Stool Black. Showcasing its originality and distinctive design, the Houston Bar Stool will make an impressive impact at your kitchen worktop, island, bar table, or even breakfast bar. With panelled stitch detailing, the ergonomic seat and high encompassing backrest are upholstered in classic black faux leather. 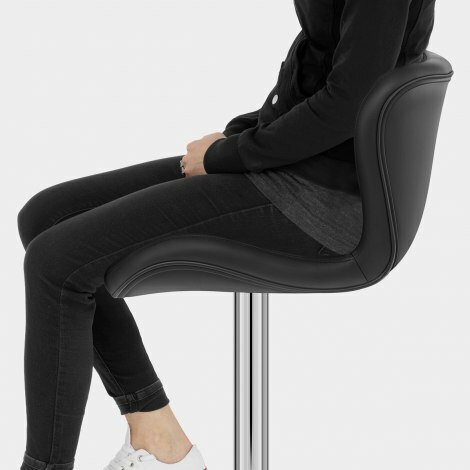 Offering excellent support, the tall backrest also has winglets that add to the encompassing feel. The frame beneath the seat has a mirrored chrome finish, and is complete with a curved footrest and circular base with protective guard. 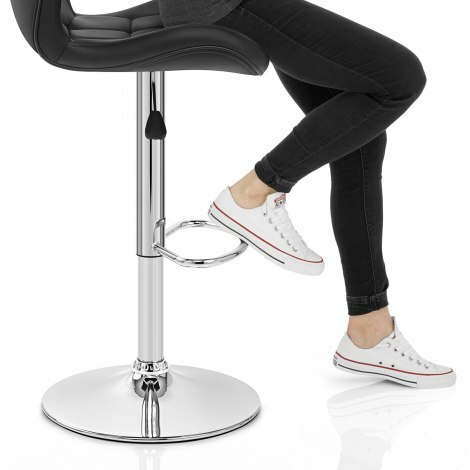 Housed within the chrome column, the gas lift mechanism lets you adjust the height of the stool and a 360-degree swivel feature is also included. "Excellent quality, very comfortable and stylish"
Absolutely delighted with the delivery, comfort, quality and value of these stool, i would highly recommend them. I love my new bar stool and its abilities, the main thing while choosing a bar stool was the height it can go up to and turn around! The price was good and the quality is excellent. Excellent quality, very comfortable and stylish. Ordered on Saturday here on Monday. Fantastic service. Love the chairs. quick delivery in excellent condition. The Grandkids of 3 and 6 love them too. Although the continual getting Grandad to spin them round and round and round is starting to wear me out. They are perfect for our needs.